I'm a lucky little nerd this month, as I've been given the opportunity to be sent October's MyGeekBox(*) to take a look at. For those of you who are in the dark, each month MyGeekBox send you a box full of mystery good that centre around a theme. Previous themes have included; Justice, Sidekicks, Abilities and Toons. This month's theme, in an ode to my favourite time of the year, Halloween, was Afterlife. The first thing that I saw when I opened this lovely little box, that surprisingly survived being in the hands of Royal Mail, was an adorable Boo! T-Shirt. I love it when shirts like these are several sizes too big, so I ordered a massive size so that it's long enough for me to throw it on with leggings for lazy days so I can geek out in style. The next thing that I saw absolutely blew my mind, at first it made me think of all the blood stained promos Dexter. It's actually a Bloody Hand Print Tea Towel, as a fan of horror/collector of tea towels I absolutely love this one. There was also some zombie themed decor in the form of a sticker and a metal wall sign, which I'm sure that my boyfriend will be stealing from me. I don't know if anyone has seen the stocking fillers that most shops have brought in for Christmas, but I've noticed that a lot of them are selling puzzles that come in the form of a little man that you have to turn into a box, so I was pleased to see what is possibly the quirkiest variation of this; a Dracula Petrifying Puzzle! I'm obsessed with brain teasing puzzles, so I will definitely be spending a few good minutes (hours) trying to solve this. Luckily it does come with the answer in case you get too frustrated. Finally, and possibly my favourite item next to the Boo! T-Shirt, is the graphic novel Twisted Dark by Neil Gibson. It's described as 'a series of interconnected psychological thrillers', which I believe comes in the form of eight stories tying in with one another. It's a welcome addition to my graphic novel collection and I'm really looking forward to reading it! 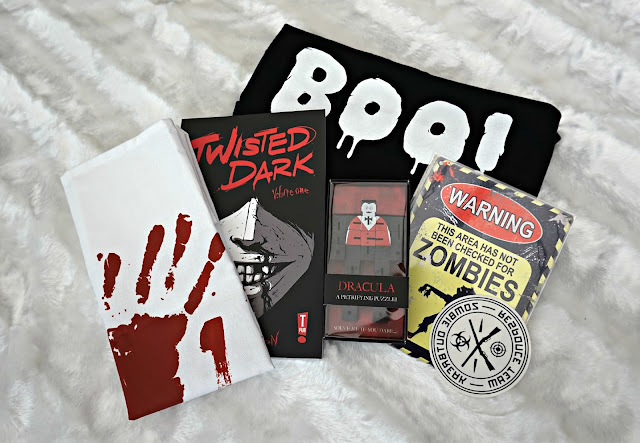 Overall, I was really impressed with October's MyGeekBox, and, seeing as next month's theme is right up my street as it's Movies and Television, I think that I'll be investing in another! What did you think of this month's MyGeekBox? Have you ever invested in a blind box before? Let me know by tweeting me or leaving a comment!